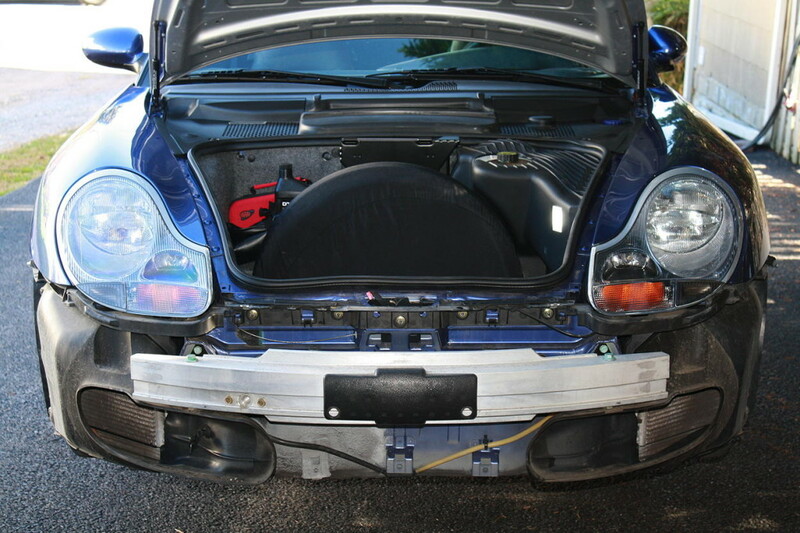 As we’ve shown on this site before, the front mounted radiators of the 996 collect all kinds of debris over time. We bought this kit from Rennline many months ago, but never got around to putting it on. Since we had the bumper cover off this weekend for some other work, we thought we’d try it out (and clean out the debris again). The install process is fairly easy. The hardest part is getting to all of the appropriate screws to remove the bumper cover. Put your car on jack stands and remove the front wheels. 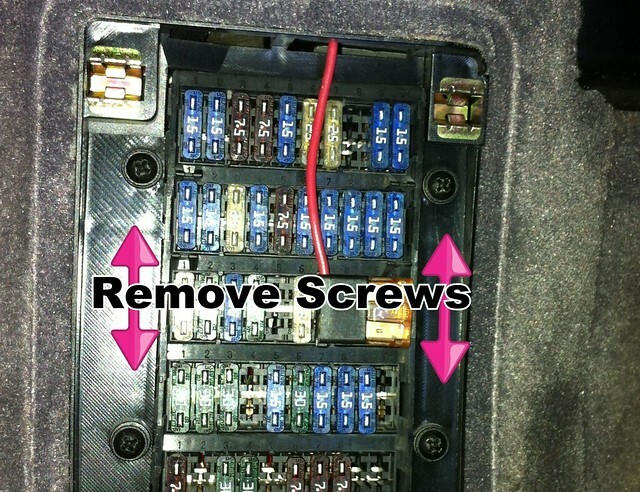 Start by removing the screws under the cover-plate for the trunk release. 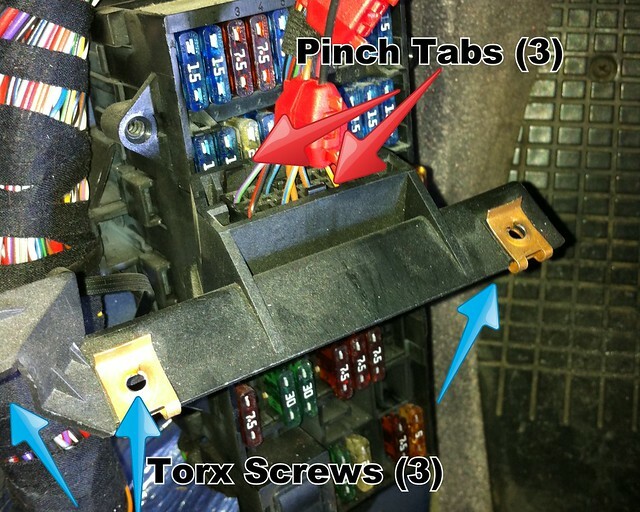 Pop out the side-markers and remove the two screws there. Pop the two closest quick-releases to the side markers, and remove the screw that mounts up into the side-marker. Shift to the bottom of the bumper cover. Remove the five torx screws. The cover should slide forward and off of the bumper. We’ll be working from the back side of the bumper cover to install the grilles. We don’t have a third radiator in the middle of our bumper. There’s a blanking plate that covers this space. You could remove the plate to add a grille, but we just skipped that step. The grill is included in the kit. Fit the grilles and bend them to conform to the shape of the openings. Use the screws included to the kit to attach the grilles, taking care not to screw anywhere that would be visible from the front. Because the grilles fit between the black housing and the rubber radiator ducts, it takes some finesse to get the bumper cover back in place when finished, just be patient and work both sides evenly. When finished, it’s a very clean look. But would I still buy the kit today if I had a choice? Probably not. These grilles are pricey for what you get. If I were doing it again, I would just buy some Gutter Guard at home depot and some short, sell tapping screws. When you buy this kit, you’re really just buying time. How much time would it take you to figure out the right shape, bend and cut the raw material, then figure out where best to attach it. The shape isn’t that complex and the grilles are sandwiched between the bumper cover and radiator housings anyway so they don’t need to be that secure. Save your money and try it the Home Depot way first. If you fail, you’re only out $5. If you succeed, you just saved $270. 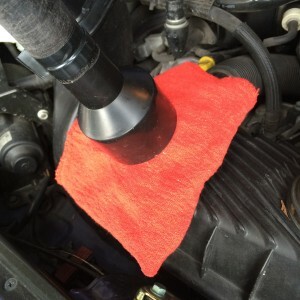 Have you ever needed to change a drain plug or a drain plug seal ring, but didn’t want to change your oil? 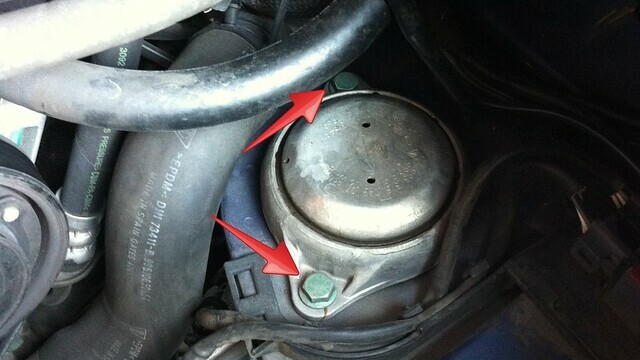 This post shows you how by using your shop-vac to pull a vacuum on the oil fill tube which will hold the oil in your oil pan even when you remove the drain plug. You will need a clean shop towel, folded in quarters; a shop vac hose adapter that’s slightly larger than the oil fill tube opening; and assistant to hold it in place and operate the shop vac. In this case, I’m working on a Porsche 996. The 2.5 inch hose adapter fits over the fill tube and is taped to the end of the shop vac hose. It is very important that the hose adapter not move or you will lose the vacuum holding the oil in the pan. Listen to the tone of the shop vac once the video starts. You will hear the tone change when the drain plug is removed, but the oil will not start flowing as long as the vacuum stays on. To change the drain plug seal ring, you just need to keep the vacuum running and you have time to remove the plug, change the ring, and put the plug back in. Wait until it’s is hand tight before you release the vacuum. In this video I’m actually going to dump the oil for an oil change (using Driven DT-40), but I wanted to show you how it works and that there really is oil in this engine. Enjoy. The engine in the 996/997 hangs from the motor mounts rather than sitting on them as in most other cars. As a consequence of this design, it’s hard to tell by visual inspection when they’ve worn out. As they stretch and degrade over time the car may idle rough or one side of the exhaust may appear to hang lower than the other. Once you take the mount off of the car, you can see as in the photo above how the old one is distended compared to the new one. The replacement procedure is very simple and can be done by any shade-tree mechanic with a good floor jack. Jack-stands for the rear of the car help, but are not required. One could just park the car on some 2x4s to get a little additional working room and easily make the swap with just the jack. 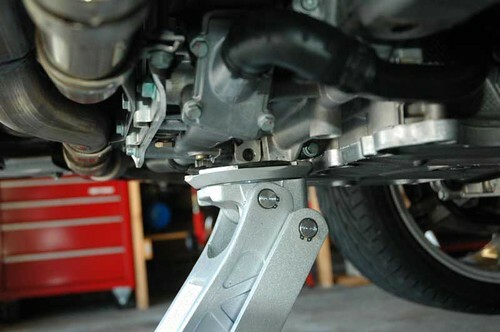 We recommend using jack-stands just because it’s easier to move around under the car. 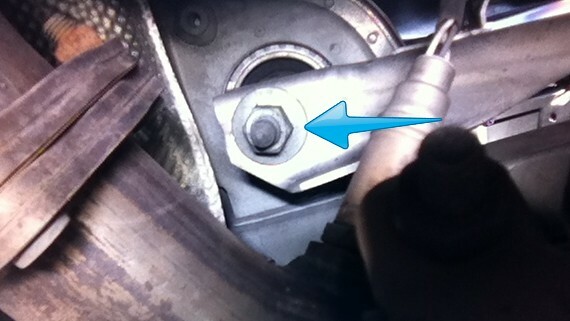 Make sure the engine is cold before trying to move your hands through the exhaust-header to get to the lower nuts. As long as you only remove one mount at a time, you don’t have to worry about repositioning the engine to make it line up with the mount. 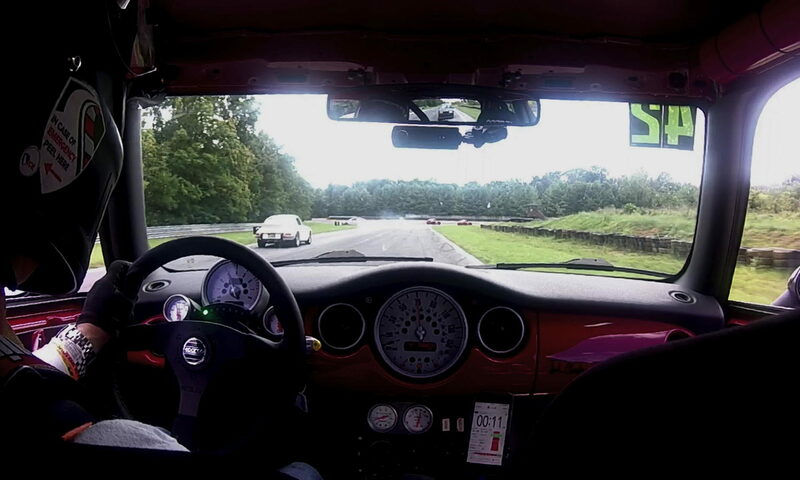 You can choose to use stock mounts; solid motorsports mounts; or semi-solid. I went with stock. Tools required: Socket wrench; torque wrench; 13mm socket; 18mm socket (deep); and a 6 inch extension. Parts needed: Two replacement mounts, Porsche Part Number 993-375-049-08-M270 (for 1999-2005 non-turbo 996.) 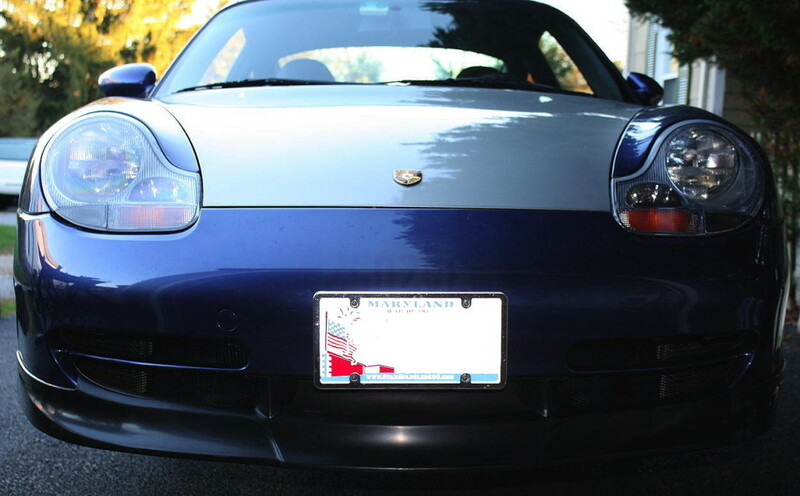 [Yes, that is a 993 part number, and yes, it is correct.] 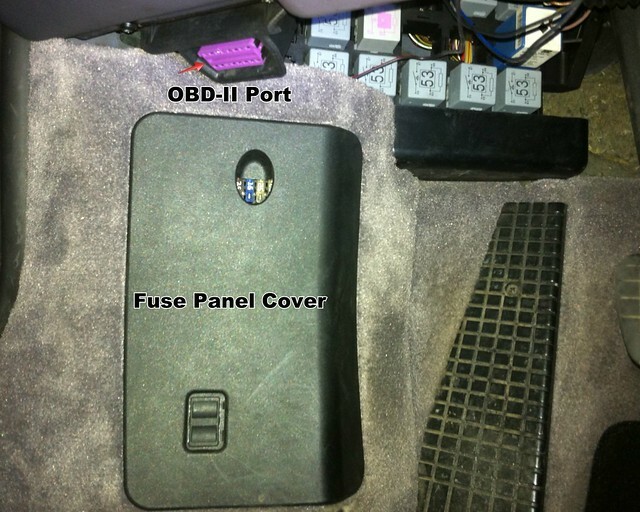 997 Porsche Part Number is 997-375-049-08. 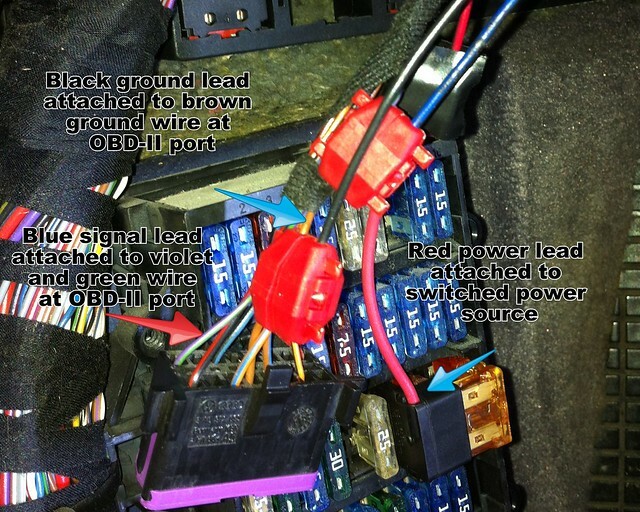 If you are going to Track your car, consider upgrading the motor mounts to a more solid design. You’ll get less engine movement at the price of bit more vibration at idle. Like all of our DIYs posted here: Proceed at your own risk — no wagering. These instructions are intended to familiarize you with the process and are not a substitute for a good shop manual. Safely jack up the rear of the car and place on jack-stands. Place the floor jack under the engine just behind the oil pan as seen in the photo. Use a block of wood (or a hockey puck) to avoid damaging the engine. Support the weight of the engine with the jack but do not lift the car off of the jack stands. 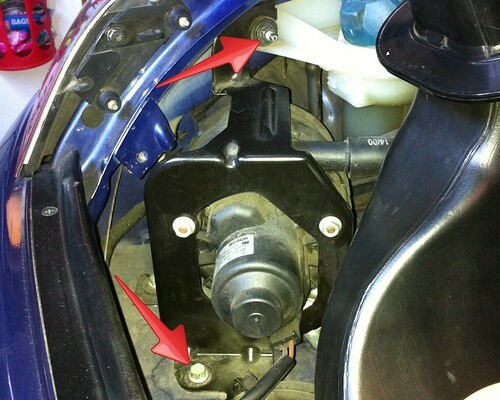 Loosen two bolts and swing the secondary air pump out of the way. Start at the right mount and remove the lower nut using a deep 18mm socket and a 6 inch extension. 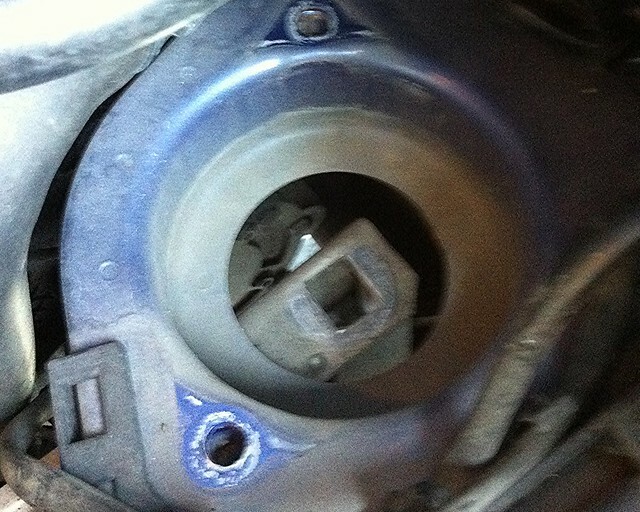 Remove the two upper bolts with a 13 mm socket and remove the old mount. Inspect and clean the area where the mount sits in the chassis. Insert the new mount. Install two upper bolts and torque to 25 ft lbs. Install lower nut and torque to 63 ft lbs. Repeat procedure on the left side. 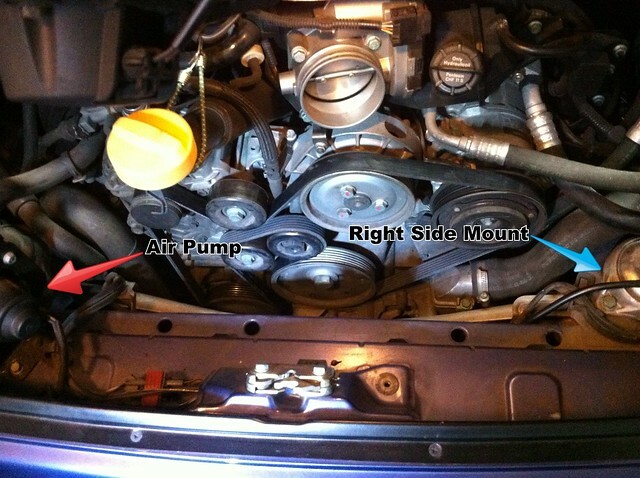 Replace secondary air pump and air box. 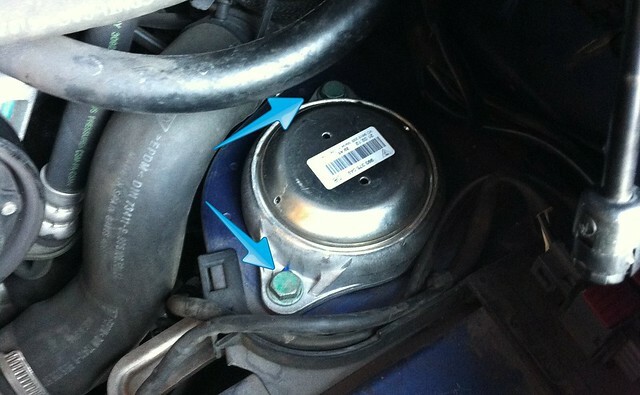 Lower car and inspect exhaust tip position. 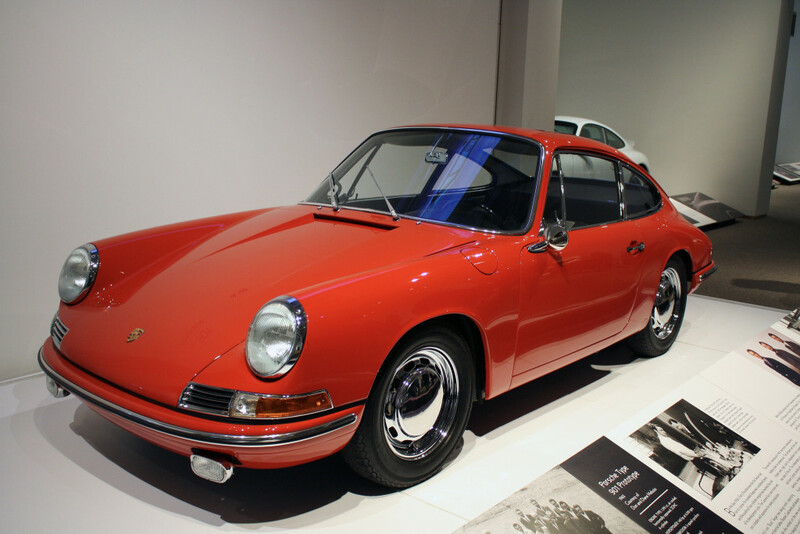 On the way to Hilton Head Island this past week, we stopped by the North Carolina Museum of Art which is hosting “Porsche by Design: Seducing Speed” through January 20, 2014. 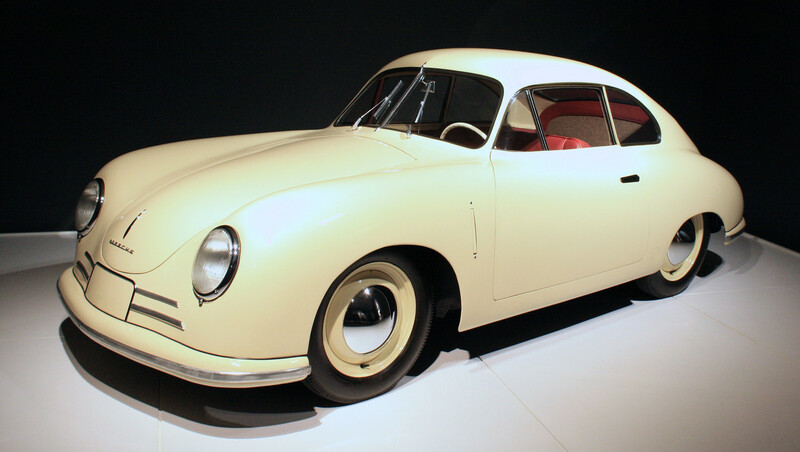 The show presents 22 Porsche automobiles going back to 1938 including the 1949 356 Gmuend Coupe (above) as well as Steve McQueen’s 356 Speedster and Janis Joplin’s art car. 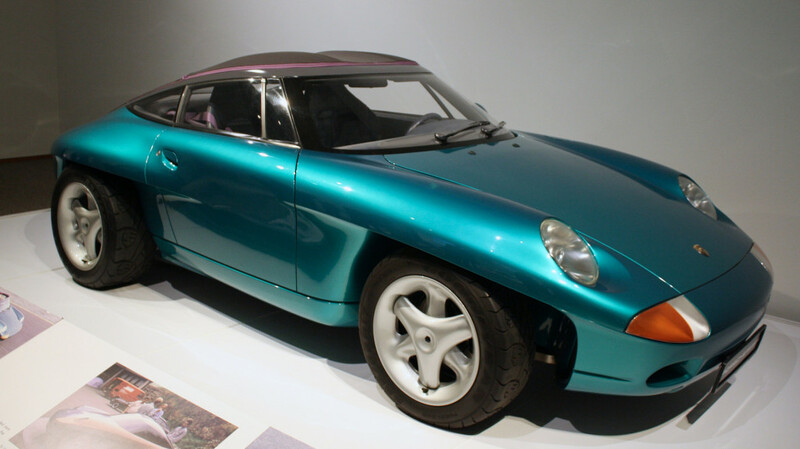 The collection includes 5 cars from the Porsche museum — a first for a North American exhibition — including the single ugliest Porsche Prototype we’ve ever seen. This car was presented to Ferry Porsche as a birthday present in 1989. Sort of the ugly sweater your aunt gave you, he drove it a few times and then found a safe place to “preserve” it in the museum. 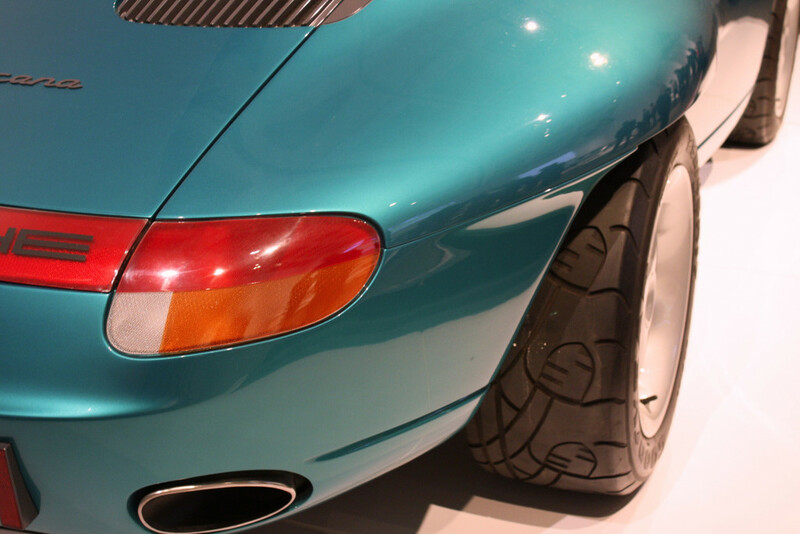 The coolest feature of this car was the Porsche Crest tread pattern in the tires. 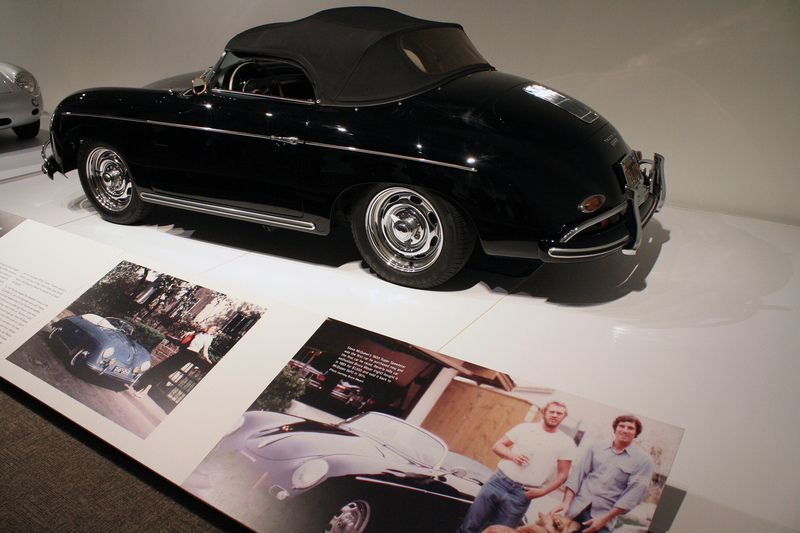 Steve McQueen’s 356 Cabriolet is still owned by his son, Chad. 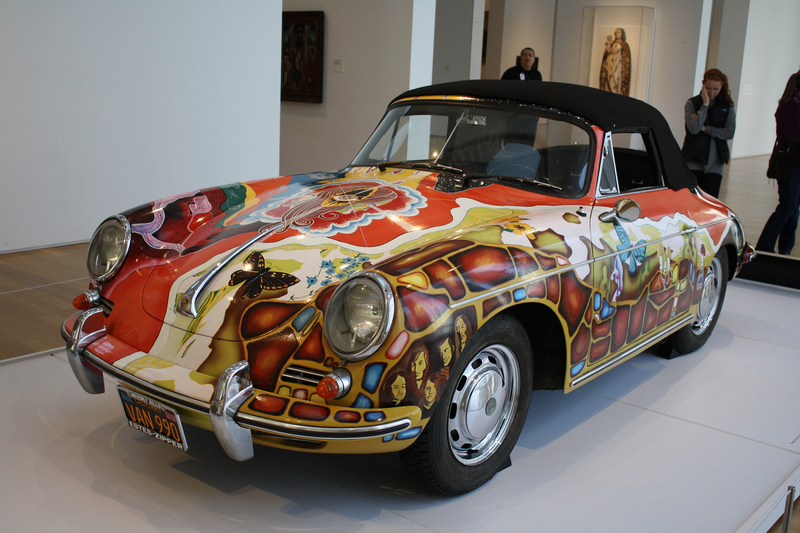 And the Janis Joplin car is very, er…. unique. I guess if you can’t recall the Summer of Love, you just don’t get it. I enjoyed seeing the 917K, 962C, and IROC RSR race cars, but my favorite car of the show was the 1963 901 Prototype that started the life of the 911. The full set of photos from the show is here on Flickr.